Welcome to Hutchinson, Kansas. Come share our space - if you can excavate some. 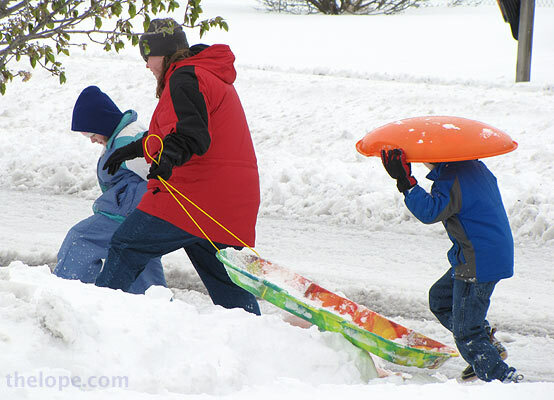 A group of sledders turns inconvenience to opportunity as they head east down Avenue A, most probably to the slopes at the K-61 overpass. 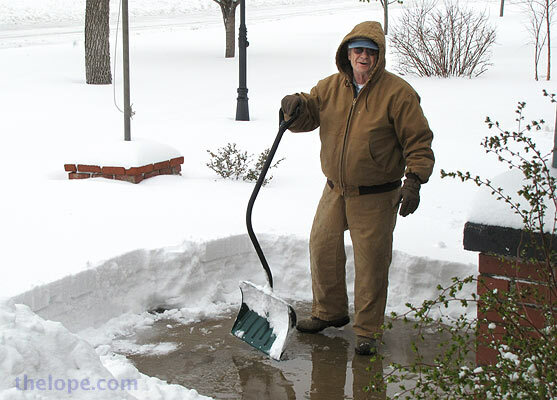 I took a little walk around my neighborhood in the south-central part of town this morning during the waning hours of the blizzard, looking for pictures of my neighbors coping with the storm. I stopped a lot; it's actually hard to walk in all that puffed ice. This is Patsy Terrell's car; I don't think she'll be using it soon. 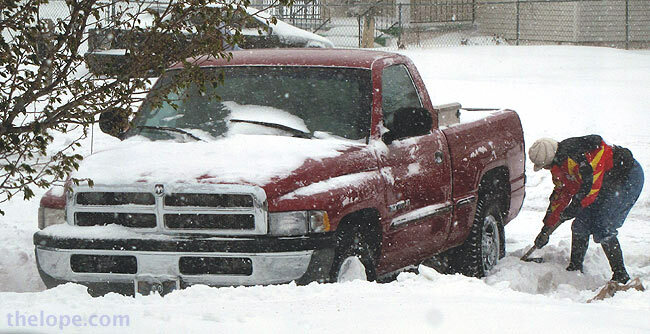 Hutchinson, along with much of Kansas, Oklahoma and parts of Texas, is coping with a major Spring blizzard that began Friday. A neighbor helps excavate a pickup truck. 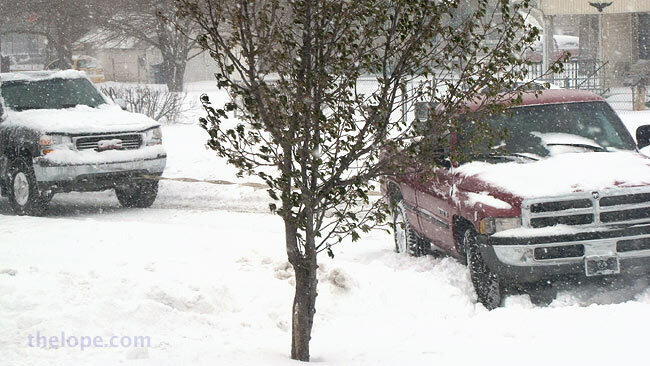 Avenue A is kept fairly clear by the city, but even trucks were trapped in driveways. Eventually, another truck with a tow line had to be employed. Bob Arpin watches city and county road crews go by. Bob has excavated part of his driveway. I asked if he really thought he was going somewhere and he said "no; I'm just looking for something to do." I think that says something good about his generation. And just how deep is that snow? 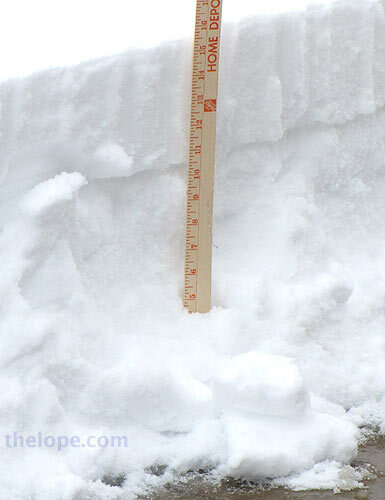 Just past the area Bob has cleared, his yardstick shows fifteen inches of snow. It's even a bit deeper, closer to his house. 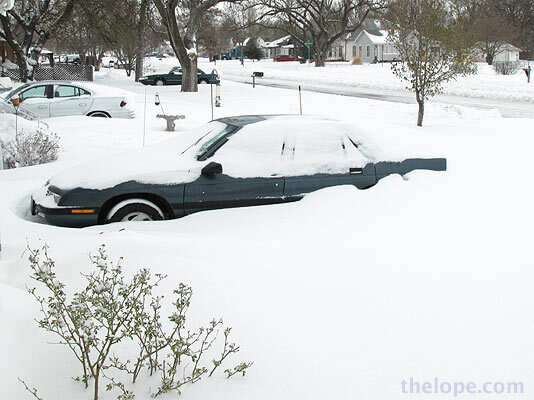 News reports indicate measurements elsewhere in Hutchinson up to 18 inches. What I find interesting is the stratification of the snow drifts - it's a lot like geology. 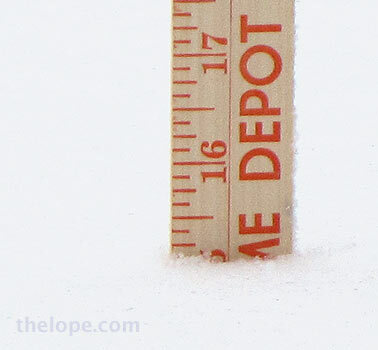 You can see a layer of sleet that fell overnight at about the ten-inch mark. I found Bob's technique logical. 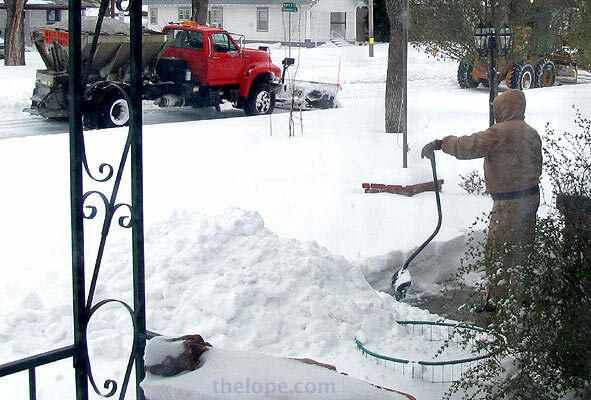 He slices and lifts small sections of snow. He says it's a lot easier to move. Here is the tree seen in yesterday's blog post. You can see the snow is higher on the trunk. Notice how there is very little snow on the roof of the house pictured. 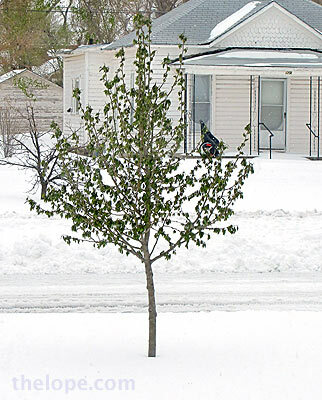 This was a very dry snow and was driven by strong winds, so little of it settled on roofs or branches.